At IFA 2015, Lenovo refreshed its ThinkPad E Series laptops. 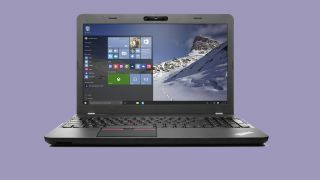 Designed for small and medium businesses, Lenovo says that its 14- and 15.6-inch E series notebooks deliver performance at an affordable price, and the laptops now come with the latest processors from Intel and AMD along with optional extras such as a fingerprint scanner, Intel RealSense 3D cameras and ample ports. These laptops feature up to a 10% increase in processing power and up to a 34% in the integrated graphics department compared to the previous generation models. The ThinkPad E460 comes with a 14-inch display, while the E560 is equipped with a 15.6-inch screen. Users can choose between an HD or FHD resolution panel on either display size. The Intel-powered E460 and E560 can be configured with up to a Core i7 Skylake processor, optional AMD Radeon R7 graphics, a maximum of 16GB DDR3 RAM and up to 1TB hard drive. The laptops are rated to last for nine hours on a single charge. Both laptops come with three USB 3.0 ports, single HDMI connection, OneLink and a 4-in-1 card reader. The larger E560 also comes with a VGA port for legacy connections and an optical disc drive. The E460 measures 13.35 x 9.41 x 0.90 inches (339 x 239 x 22.9mm) and has a starting weight of 4.2 pounds (1.9kg). The larger E560 has a starting weight of 5.2 pounds and measures 14.84 x 10.03 x 1.07 inches (377 x 255 x 27.1mm). The ThinkPad E465 and E565 are similar to the E460 and E560, except that they run on AMD's processors. The 14-inch E465 tops out with an A10 processor, while the 15.6-inch E565 can be configured with up to an AMD FX processor. Users can configure these laptops with an optional AMD Radeon R5 for discrete graphics. The AMD models have a maximum 6.5 hours rated battery life, and feature similar ports and design as the Intel-based counterparts. The ThinkPad E460 starts at $549 (£357, AU$771) and the E465 starts at $449 (£291, AU$630). The 15.6-inch E560 starts at $549 and the E565 starts at $479 (£311, AU$672). All laptop models will be available starting November.